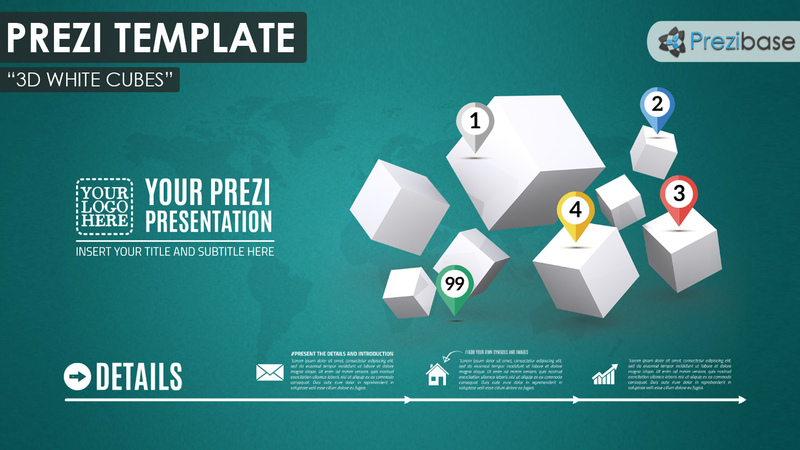 Professional looking Prezi Presentation Template with 3D white cubes on a dark world map background. Suitable for any kind of topic – business, education or personal presentation. NB: the white squares are one single 3D illustration and cannot be customized or moved separately. Zoom anywhere and add as many placeholders as you need for your presentation content. Create a simple yet professional infographic presentation and zoom in to show your data. This entry was posted in Best Prezi presentation templates and tagged 3d, 3d cubes, 3d prezi, 3d squares, 3d white cubes, box design layout, boxes, business, company, coprorate, corporate, cubes, cubial, data, earth, infographic, map, planet, presentation cubes, prezi template, prezi templates, professional, rectangles, sleek, squares, statistics, white, white squares, world.